ASP.NET MVC 6 introduces several new project types after you initially pick that you want to develop an ASP.NET MVC 6 Web Application. One of those application types is the new Web API Project. If you choose the Web API Project, a new Web API Controller Class is created for you to provide an example of responding to Get, Post, Put, and Delete requests for your API. With the Web API Project you will also notice a new API specific route added to the RouteTable in Global.asax.cs. Running the project and navigating to ~/api/values will display a list of the values in XML Format. I removed the XML namespacing to keep things simple. If you change the Accept Header so that you will only accept JSON, the same controller action will send the values via JSON instead. Creating a new Web API Controller Class is as simple as using the Add Controller Recipe in ASP.NET MVC 4 and choosing the Empty API controller Tempate. 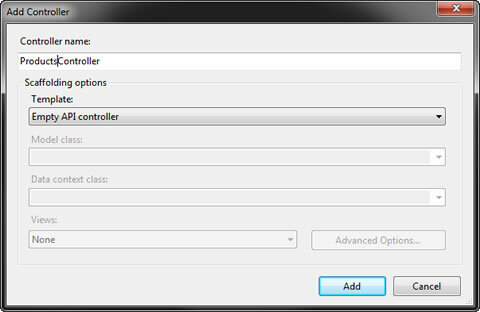 Or, you could just create one via Add Item which has a new Web API Controller Class as an option. I created a simple ProductsController that handles all the CRUD options for products in a mythical e-commerce website. You can see that in some instances I am just returning a Product and in other instances I am returning a more informational HttpResponseMessage. For example, in the case of the Post of a new Product, I need to tell the REST Client the new location of the newly added product in the header. In other actions I am also throwing a HttpResponseException if the resource requested is not found. Validation, Logging, and other concerns are being done in various ActionFilters just like in your normal ASP.NET MVC Projects. Try to pull those cross-cutting concerns out of the main logic as much as possible. If you want to enable various paging and querying of products you can make a slight change to the Get ApiController Action and return an IQueryable<Product> as opposed to IEnumerable<Product>. Now from your browser you can add paging, filtering, sorting, and other options to shape the data. Here is an example call that does paging and sorting. ASP.NET Web API integration with ASP.NET MVC 4 is really slick. Now you can easily create an API for your website using the new ApiController Base Class to respond to REST Clients. Many times we need to create a menu for a simple application. We ususally get stuck on how to bind the menu. 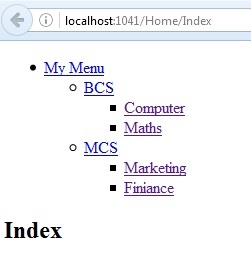 Here in this article we you will learn how to bind menu and sub menu dynamically in ASP.NET MVC from database using linq. I am going to create a database which contains the following fields as well as some dummy data which contains parent & child relationship. 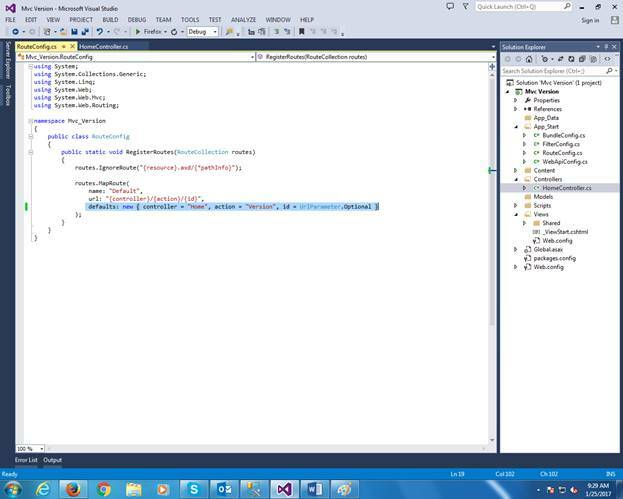 Now create simple MVC appliation using visual studio. 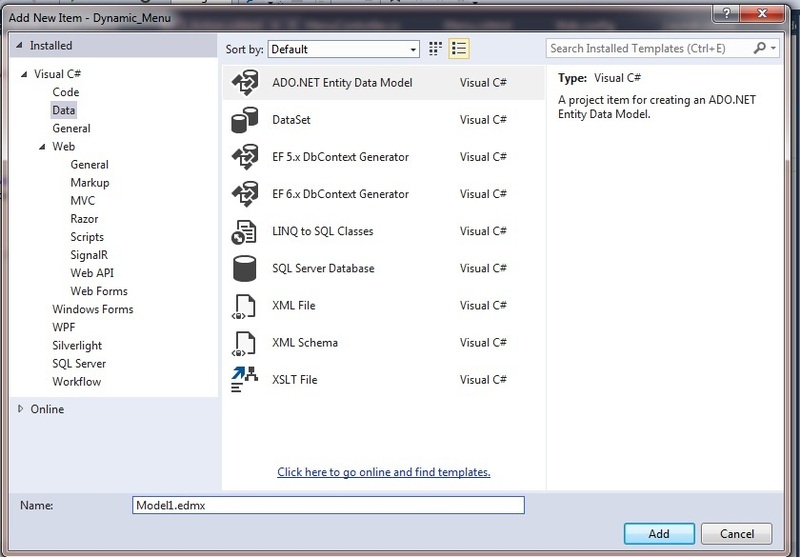 After creating project add edmx file by right clicking on project go to Add => New Item => (from right side templates) select Data => Select ADO.NET Entity Data Model => Give proper name to it and click on add button. Then select your table from database & create .edmx file into your ptoject. After adding the file autmatically connection string will get added into web config file. Now create model as below and add some properties; this model will be used into a controller & view. Now add controller into our application and write below code into it. From action method GetMenuList() we will get data from our database using linq query. Now create a view for Index action method as like. This is just demo / sample application, according to your requirement you can add foreach loop for more hierarchy levels. This is only a two level menu tree strucure. Index view after running the application into a browser. 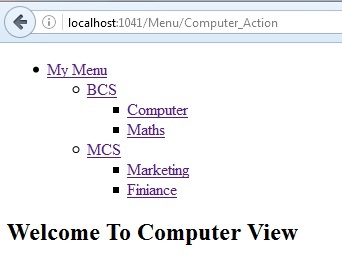 In this article, you learned how to bind menu and sub menu dynamically in ASP.NET MVC from database using linq. ASP.NET MVC 6 Hosting - HostForLIFE.eu :: Is MVC Replacing ASP.NET Web Forms? We often think that one technology will be totally replaced by a new release or new version of technology. This article tries to dicuss that and similar issues and I will share my industry experience, not just what I have seen in India (the largest IT Solutions Provider to the world) but also in the USA. I consider this to be a very hot topic and a good candidate of debate but I will try to share my thoughts on such a burning topic. This article does not highlight or defame any technology, I am just going to provide my perspective as I have seen, experienced and advised to various clients and software teams. The principle “Change is Constant” applies very well to the software industry and I respect this overflow of information. Because this gives me reason to “Keep Learning and stay ahead of the Curve”. By saying so I didn't mean that someone must learn anything and everything you can get your hands on. No, certainly not, but before I explain this any further let's take a step back and understand “Why new Versions” keep coming. We are fortunate that we have seen complete transition of the software industry from Desktop to Web to Mobile, future generations may not witness this great and life changing shift. Also, I recall my days when I was working and studying software in 1995, no one imagined that there will be MVC, WPF, WCF, so many versions of .NET and SQL Server and so on. Industry was happy with Microsoft Access, FoxPro, C, C++ and Oracle and so on. But our needs keep changing, they evolved and then shell is broken to have huge expansion and today we have many kinds of software technology and server products from client-side to server-side to mobile and hand-held and many more. We moved from on premise to the Cloud and Machine Learning is helping to dictate patterns and suggest needs. This is why software companies keep building the latest and newest technologies to enable and empower the world to build for the future. When they release a version of a technology or language and they discover some issues or new features in that then they release newer versions and this in a chain-reaction process and it will not stop. As per Darwin's Evolution Theory “Survival of the Fittest”, "fit" refers to "best adapted to the current environment". Here you simply replace environment with the software industry. I am one of you and I am not saying that everyone must learn everything but what I suggest is to stick to your technology of choice and have good knowledge of the offered tools and technologies and various versions and when to use which one. Also, you don't necessarily need to understand every single thing. For example, I only focus on .NET and related technologies, if anything falls beyond this area then I am not bothered. To be more precise, I don't understand Microsoft CRM, SharePoint, System Center, SQL Server Database Administration and few more things like that. But this is not my weak point because “I continue to build my .NET Muscle” and continue to learn about what helps me build Enterprise solutions using Microsoft .NET. So choose your area of interest and where you have invested and then keep learning in a similar field and then you will no longer find it challenging because if you observe, new versions come after every few years and that must be otherwise it will be no fun! Such decisions are not final and have no concrete answers. Yes, the industry changes their needs and so new technologies such as MVC and WPF takes over. This definitely doesn't mean that ASP.NET Web Forms is replaced or it's dead. If you understand the Microsoft Web fundamentals, MVC is based on ASP.NET and industry is trying to shift as and when they can from Web Forms to MVC and reap the benefits it offers. Did you know that MVC is much older than ASP.NET? Yes, ASP.NET 1.0 was released in 2002 and MVC was created in 1979 originally named as “Thing-Model-View-Controller” but later simplified to be known as MVC. In my view I consider that there are now two technologies to build Web Solutions using Microsoft and based on your needs you can pick one that works well for you. Usually such technology selections are made by architects assigned to the project. So there is no such Golden Rule that every new or existing application must be either created using MVC or migrated to MVC because MVC is the latest and future the of web. Though it is. All software applications you have worked or will work in future are either Brownfield or Greenfield. Brownfield Development: When any existing or legacy applications need to have new features or changes to address business needs, it is known as brownfield. In such situations, unless you are building a new module or component, you have less, limited or no scope to use new architectural styles, patterns and so on. The very reason of such limitations is because those old applications are built using an old version of technologies and the latest versions of one technology/framework and many are not be compatible with old versions. Greenfield Development: When a brand-new project is being envisioned and no previous work is done in that or a related area then it's called Greenfield. In the software industry it doesn't happen very often. But whenever it happens its the architect's responsibility to determine what the best technology is to address business needs. Hence, it's not appropriate to say that because MVC is so new hence every new web application must be made using MVC or if WPF is available in addition to Windows Forms so every desktop application must be made using WPF. Whatever is the case neither ASP.NET Web Forms nor Windows Forms can be totally ignored. First the reasons why not. It's Brownfield and new technology doesn't fit anywhere. If new technology or versions are introduced then it will cause many build errors due to outdated references of non-supported library references. Business goals and software quality are not compromised by continuing to use current and available technologies like ASP.NET Web Forms over MVC or Windows Forms over WPF. You are not investing money in any extra off-the-shelf tools to handle issues that could have been handled by the latest versions of similar area of technologies, for example MVC instead of ASP.NET Web Forms, or WPF over Windows Forms. Budget allocation from a client often may impact your decision to use and develop using the latest technologies. If the core/bestselling features of a new candidate technology (MVC or WPF) are not being used at least up to 50% then you have done nothing. Considering how soon the client and business wants to have an application ready, it turns being a major factor to dictate the technology of choice. The client and business doesn't care how you do it; what matters is the end-result and a workable / good-enough software. No way to use old legacy downstream applications with the latest available technologies. Greenfield software solution and no legacy or old piece of code is being used. Focus is more on Robustness, Testability, Object Oriented design and quality. (This doesn't mean previous technology can't accomplish these; it's about ease and in-built features and offerings). Amazing team with great skills to learn new technologies and adapt the changes. Company's vision is to showcase products build using latest technologies. Client themselves want the solution to be developed using latest technologies and have budget to support that. Note: this section assumes that you are aware of MVC benefits and the general technical terms used below. Separation of Concerns is the core of MVC. Single Responsibility Principle is done by default. Unified and even better framework to work on WebAPI, Mobile, HTML 5, CSS3, Security and Deployment (including Azure). Unit testing is easily done to have stable, robust and quality software solutions delivered continuously. Fast screen generation for CRUD operations via Scaffolding. Based on my experience as an architect in the industry I would like to summarize that it's very hard for any organization to keep up with the latest version and technologies all the time because by the time you become comfortable with one version the newer is around the corner. So if you are working on MVC 4, then see if you can learn and try some application being developed on your own. Or if you just happen to be in the ASP.NET Web Forms world until now then I would encourage you to try converting that application to MVC for your personal benefit. This will force you to learn new technology and apply that learning. If you have made some progress in that then in the next interview you can proudly showcase your MVC knowledge and say that you have migrated ASP.NET Web Forms to MVC. Charts are an important aspect of reports as they make it simpler to understand a certain problem. Making charts clickable adds more reinforcement into the understanding of the problem. Today, I shall be demonstrating clickable charts using Google Charts API in ASP.NET MVC5. Google Charts API is simple to use and provides a variety of options for customization of graphical chart reports for better analytical purposes. Following are some prerequisites before you proceed further in this tutorial. Knowledge of Google charts API. You can download the complete source code for this tutorial or you can follow the step by step discussion below. 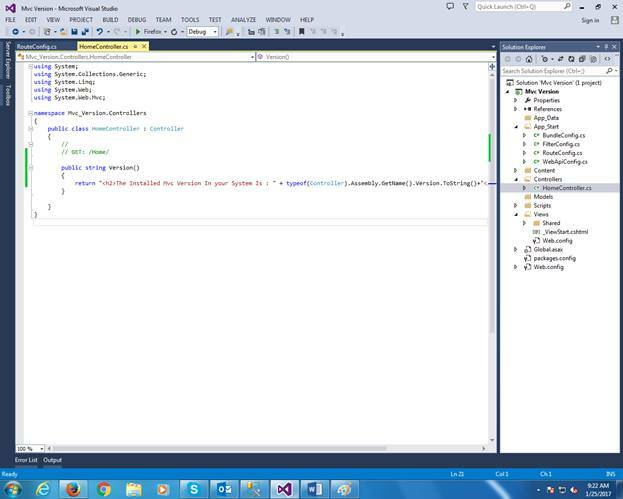 The sample code is developed in Microsoft Visual Studio 2015 Enterprise. I am using SalesOrderDetail table extracted from Adventure Works Sample Database. Create a new MVC5 web application project and name it "Graphs". Open "Views\Shared\_Layout.cshtml" file and replace the following code in it. In the above code, I have simply created the basic layout structure of this web project and I have also add reference to the Google charts API. Create a new "Models\HomeViewModels.cs" file and replace with the following code in it. In the above code, we have simply created our View Model which will map the data from text file into main memory as object. Also, notice that we have added "Link" property, which we will use as our clickable destination. Now, create "Controllers\HomeController.cs" file and replace the following code in it. // Loading drop down lists. In the above code, I have created a simple index() & TestPage() action methods along with a helper method LoadData() for data loading from text file and finally, GetData() action method which will be called by Google charts API AJAX method in order to map the data on the chart. The GetData() action method will return top the top two rows only which are sorted by product and unit price and grouped by product name. Create a new "Scripts\script-custom-graphs.js" script file and replace the following code in it. // Load the Visualization API and the piechart package. // Instantiate and draw our chart, passing in some options. // Add our selection handler. Let's break down the code chunk by chunk. First, I have loaded the Google Charts API charts visualization package. Create "Views\Home\_ViewGraphPartial.cshtml" & "Views\Home\Index.cshtml" files and replace following code in it. In the above code, I have simply created the view code for the page which will display the chart. I have divided the page into two parts for better manageability. Now, create new "Views\Home\TestPage.cshtml" file and replace following code in it. In the above code, I have simply added a new page structure for the chart click event target. ASP.NET MVC 6 Hosting - HostForLIFE.eu :: How to Extend ASP.NET MVC AuthorizeAttribute? Today, I will show you how to Extend ASP.NET MVC AuthorizeAttribute and how to Unit Test with ControllerActionInvoker. The reason for extending the AuthorizeAttribute class is that we might decide to store user credential information in a variety of differently data sources such as Active Directory, a database, an encrypted text file, etc…Or we might add custom logic to authorize a user. //the user is not allowed to execute the Action. An Unauthorized result is raised. //windowLoginName and ADGroup is expected to have this format "ABC\\XYZ"
In the sublassCustomAuthorizeAttribute above we override the OnAuthorization(Authorization Context filterContext) method and provide the logic to identify the windows login user, check the person against the list of authorized Active Directory groups and Windows users from web.config. We also override against the HandleUnauthorizedRequest(AuthorizationContextfilterContext) method to return a view for access denied. Of course, as mentioned, the authorization logic can be made as flexible and complex as possible according to specific business needs. There we have it, we have come up with how to implement custom security as an attribute to be applied to a controller. Last Friday, while working on a web application based on ASP.Net Core 2.1, I came across a scenario where I had to put some data into memory. While that's not a problem, the catch is that the data has to be unique for each HTTP Session. Consider it as keeping a key that is to be used across different views to display some information related to that particular session. The only possible solution satisfying my needs was to keep the "key" in session. However, the last point in the code that has access to the key is a simple helper class and not an MVC Controller. And we had no intentions to expose the "key" to our controller. So, the question remains: how do we save the key in session without exposing it to the controller? As it can be seen in the above code, we are simply setting a message in the ViewData and rendering it on the view. Nothing fancy so far. Now, let's see how we can set our message in Http Session from RequestHandler and later access it inside the controller. Note that I'm using Sesseion.GetStringValue(key) which is an extension method that I have added to retrieve data from the session, however, it's not really required. You can simply use the Session.TryGetValue(key, value) as well. In case you have not figured it out already, I must tell you that we need to register our RequestHandler in the ConfigureServices method of the Startup class so that the dependency for our controller can be resolved. With the above changes in place, we can now access the HttpContext.Session inside our request handler and the same can be done for any other class as well. However, there is one thing that I don't like about this approach. For every single component where we need to access the session, we have to inject a dependency of IHttpContextAccessor. While for one or two components it's not a problem, it can be very daunting if we have to do the same over and over again. There is a way to achieve the same accessibility without having to inject any dependency, but that's a story for another day and I will write about that in my next post. This article demonstrates how to create charts in ASP.NET MVC using Chart.js and C#. This article starts with how to use Chart.js in your MVC project. After that, it demonstrates how to add charts to a View. In this article, Chart.js CDN (v2.6.0) is used for demonstration purposes. In the View (*.cshtml), add the Chart.js CDN along with jQuery CDN (recommended) in the head section if you haven’t mentioned those in layout pages. In the following example, the <canvas> tag is used to hold the chart in View’s <body> section. Now, in the Controller class, let’s add a method to return the data for the chart that we added in the View. In this example, we are using JSON format for the source data. The data for axises is combined to a single List<Object>, and returned from the method as JSON. AJAX calls are used in the <script> section of View to call the method in Controller to get the chart data. aData has the data for X-Axis labels and aData has the data for Y-Axis correspondingly. As in the code, the AJAX call is made to the Controller method ’/Chart/NewChart’ where ‘Chart’ is the name of the Controller class and ‘NewChart’ is the method which returns the source data for the chart in JSON format. AJAX call, when returned successfully, processes the returned JSON data. The JSON data is processed to extract the labels and axis data for the chart preparation. The 2D context of the canvas ‘myChart’ is created using ‘getContext("2d")’ method, and then the context is used to create the chart object in ‘new Chart()’ method inside the script. How to reuse parts of web pages using View Components in ASP.NET Core MVC. In an empty project, update Startup class to add services and middleware for MVC. Add a Model to display in the View. Add a Controller with action method returning ViewResult. Add a parent View named Index.cshtml. Add a View Component’s Model. Add a View Component’s class. Add a View Component’s View named as Default.cshtml. View Components are special type of Views rendered inside other Views. They are useful for reusing parts of a View or splitting a large View into smaller components. Unlike Partial Views, View Components do not rely on Controllers. They have their own class to implement the logic to build component’s model and Razor View page to display HTML/CSS. I like to think of them as mini-controllers, although this is not strictly correct but helps conceptualize their usage. Unlike Controllers, they do not handle HTTP requests or have Controller lifecycle, which means they can’t rely on filters or model binding. View Components can utilize dependency injection, which makes them powerful and testable. There are a few ways to create View Components. I’ll discuss the most commonly used (and best in my view) option. 1. Create a class (anywhere in your project) and inherit from ViewComponent abstract class. Name of the class, by convention, ends with ViewComponent. 2. Create a method called InvokedAsync() that returns Task<IViewComponentResult>. This method can take any number of parameters, which will be passed when invoking the component (see Invoking section below). 3. Create Model e.g. via database etc. 4. Call IViewComponentResult by calling the View() method of base ViewComponent. You could pass your model to this method. Optionally you could specify the name of razor page (see Discovery section below). The base ViewComponent class gives access to useful details (via properties) like HttpContext, RouteData, IUrlHelper, IPrincipal, and ViewData. Calling @await Component.InvokeAsync(component, parameters) from the razor view. Returning ViewComponent(component, parameters) from a controller. Here, “component” is a string value refereeing to the component class. InvokeAsync() method can take any number of parameters and is passed using an anonymous object when invoking the View Component. Name of the component class, minus the ViewComponent suffix if used. Value specified in [ViewComponent] attribute applied to component class. Create A Controller named “Home” . For this, we should change the action method name in RouteConfig.cs for better loading of the page. For the first time, we will make it a start page. Add the highlighted code in your file of RouteConfig.Cs. The expected output is shown below. Produces and Consumes Attributes are newly introduced in MVC 6 (ASP.NET Core) to control the content negotiation. The process of picking the correct output format is known as Content Negotiation. Generally, Frameworks will accept two types of input/output formats those are JSON and XML. Nowadays, every framework by default accepts and returns in JSON format because of its advantages. If the user wants to control this default behavior, he should send an Accept Header with an appropriate format in GET or POST request from a client such that Framework will make sure to use the given format. If a user doesn’t provide any Accept-Header, then the framework will decide which format it should use based on its settings. Some of the most popular browsers such as Chrome and Firefox will by default add Accept Header as application/xml and that is the reason when we call the web API from the browser will display the output in XML format if we don’t explicitly set the output format as JSON. 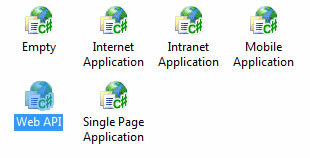 Below are the sample requests generated from Chrome and IE where can observe the Accept Headers for these two browsers. If you want to see the output in JSON format, it's preferred to use any tools like fiddler, browser dev tools etc. To control this and let the user be given full control of how to receive and sent the data format, Produces and Consumes Attribute is introduced in new ASP.NET MVC Core. This attribute helps the user to inform the framework to generate and send the output result always in given content type as follows. The above line is saying to the framework to use JSON as output format. This attribute can be decorated at controller level as well as Action level. Action level will be taken as the first priority if it is declared at both controller level as well as Action level. An Attribute helps the user to inform the framework to accept the input always in given content type as follows. The above line is saying to the framework to use JSON as input format. This attribute can be decorated at controller level as well as Action level. Action level will be taken as the first priority if it is declared at both controller level as well as Action level. If you want to control it globally, you can set this while configuring MVC in ConfigureServices method as follows.